I am planning a peach cobbler for my husband’s birthday (as well as some other secrets) coming up soon. 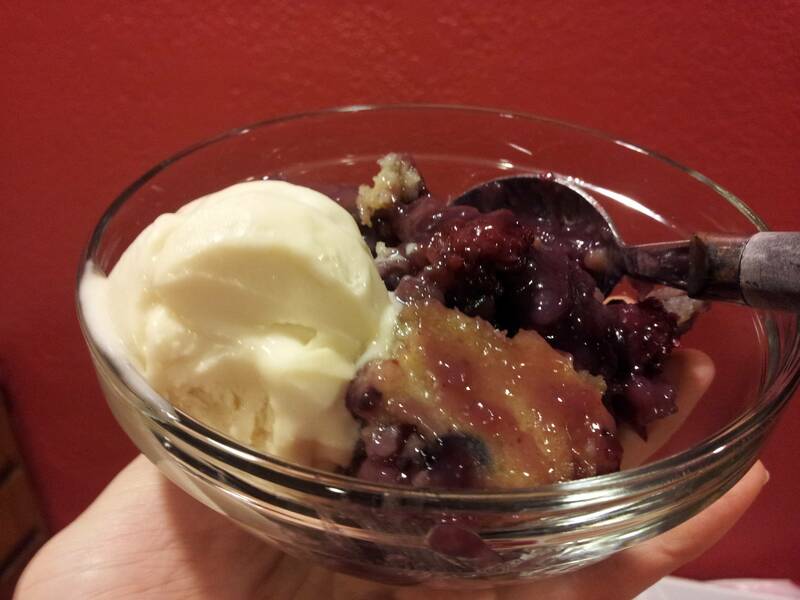 This was the first cobbler I had ever made, and I was nervous. I gave the simple crust a test run along with some lingering blackberries and blueberries I didn’t eat with my oatmeal last week. We were pleased and I bet you would be, too. Place your 4 cups of berries with all of the other ingredients in a large pot, on medium- low heat. Stir and coat the berries well. Let cook stirring occasionally until you have a juicy sauce with some whole berries still hanging around in it. Once you get a dark, syrupy juice, turn off the heat, and set aside. Next, get the stick of butter, place it in the dish you want to use, and melt it in the oven while you make the batter. I would recommend at least a 9×13. To make the crust, mix together the remaining ingredients until you have a pancake like batter. Once the butter has melted in your dish, pour just enough batter in to cover the bottom with a thin, uniform layer. Pour some of your berry sauce on top, and keep layering the batters until you are done. Do not stir, once you pour it, let it be. The layered/ marbled/random type pattern will produce a good. moist product. Bake it for around 40- 45 minutes, or until it starts to bubble up on the sides and gets thick, and the crust is golden. Serve with some ice cream, or some chopped nuts. This entry was posted in Recipes and tagged almond milk, baking powder, blackberry, blueberry, cinnamon, cobbler, egg replacer, flour, margarine, sugar.